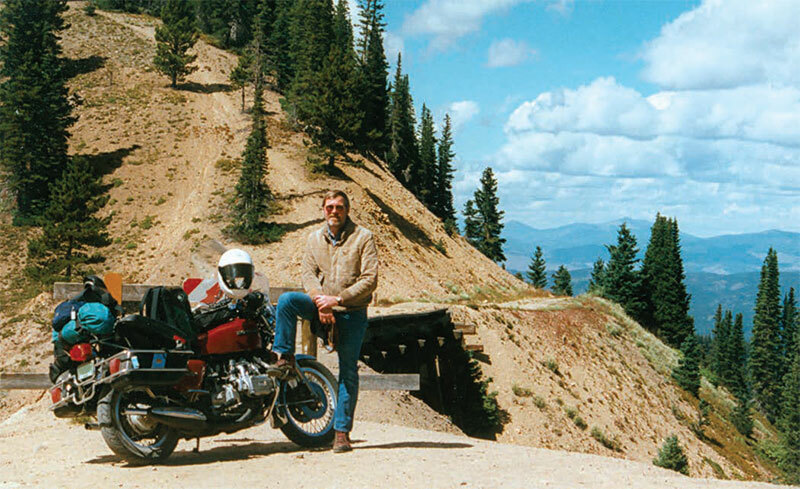 When I bought my 1976 GL1000 from a friend in 1984, I quickly discovered, such as many of you, that the bike loved “The Long Haul.” Not only that, it was a comfortable and inexpensive way to travel. I started touring throughout the western United States, camping every other night. I stayed at motels the odd nights so I could wash myself, my dishes and get free ice for the cooler. The bike was a little top-heavy with all my gear bungeed on, but had no problem with the weight. Ialso soon decided I didn’t care for the KOA experience. Might have been the hairy guy in the RV, smoking cigars and drinking beer a few yards from my site that put me off. A lot of my favorite, and more secluded, camping spots were often a few miles off the paved road. This was not off- putting since I had ridden a Yamaha 360 RT2 for years. Now the GL didn’t have a fairing (I had removed it the hard way after an encounter with an oil slick in Turkey Creek Canyon), but I did have hard bags. With a cooler, tent and sleeping bag it weighed double what the dirt bike did, even before I started adding a co-rider and all her stuff. So I went blithely on my way, over-loaded and overconfident, through Colorado, Wyoming, Utah, Idaho, Montana and Arizona. We banged over rockstrewn roads that often looked more like dried riverbeds than anything designed for sedate riding. I considered a skid plate, but no one made an aftermarket one for Gold Wings. Besides, the center stand usually hit first. A couple trials/universal tires probably would have helped. I once traversed 43 miles of rough dirt/gravel road over the Wyoming/Colorado border. It was exhausting to keep the whole rig balanced, but we made it, although we did have to stop often to pick up camp gear that bounced off. Another time, Camp Wench (her nomenclature, not mine) and I were returning to our campsite above Steamboat Springs when we got caught in one of those apocalyptic thunderstorms. We only had a mile of jeep road to go, but it was rutted and rapidly turning to mud. I had her walk the worst stretches while I spun the rear wheel and duck-walked the bike through mud and rock, lightning crashing all around. Half an hour later the rain had stopped and we were cooking dinner along the Elk River. On a solo trip to the Hovenweep ruins in the Four Corners region I had to negotiate many miles of slick rock road heading north to the Colorado border. If you find yourself contemplating the CR212 “shortcut” some day, my advice is don’t. Similarly, the “roads” on the west side of Glacier National Park were not designed or maintained with the luxo-tourer in mind. You can guess how I know. How did the bike and I fare after years of this abuse? Well, I still ride the same bike 30 plus years later. It has a few scrapes on the engine guards and hardbags, but it has the original clutch and water pump. It doesn’t leak a drop of oil. I never broke or sprained anything on my old body. This is a testament to good Honda engineering and dumb luck on my part. However, looking back on all those years of roads less traveled, my recommendation is: don’t try it on a Gold Wing. Posted 07/18/2016 by wing & filed under Featured, Road Trips.